We discussed plans and locations for the next month of meetings. This was the week of the mini-crit. 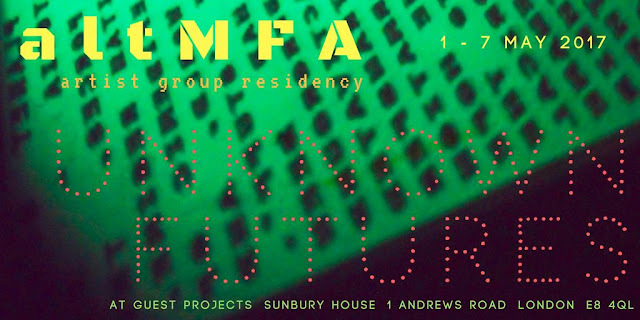 We decided to start with the newer members of AltMfa. This was the first AltMfa crit for 3 of the group so more time was allowed to explore the work and so we ended up discussing works by Fiona, Lily, Neela and Fritha. It was decided that notes should not be taken during the crit but here is a brief description. Fiona brought a concrete painting with her. We began by discussing objectively what we could see and then went on to talk about how it fitted within her work as a part of a series. Lily showed a presentation of a mix of drawings, photo documentation of performances and a short film. We discussed documentation of performance and exhibiting. Neela showed two oil paintings - one finished that day and we spoke about evolution of work and the process of questionning and talking about work. Fritha showed photographs of some sculptural pieces that will be in the show Boeing Way to Gas Street: Artists from opposite ends of The Grand Union Canal, Departure Foundation, 2nd Floor, 22 Gas Street, Birmingham B1 2JT. We talked about site specific work and moving work from the studio to an exhibition space and the effects this can have on the appearance of a piece.